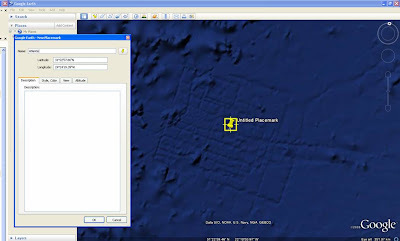 Atlantis - Google Earth shows the location of the Lost City? Lots of excitement today as the Sun newspaper is reporting on its front page that Google Earth (or more precisely Google Ocean from the latest iteration of Google Earth) is showing the location of the Lost City of Atlantis. The co-ordinates of the Atlantis discovery are LAT 31 degrees 25'24.45"N, LONG 24 degrees 25'37.01"W. You can either use these to go straight there or alternatively hunt around near the Canary Islands. So is this the Lost City of Atlantis? What it does show though is how mainstream online tools and technology have become. Even with the subject matter involved, it is still remarkable that the Sun have chosen to feature Google Earth as their front page main story! 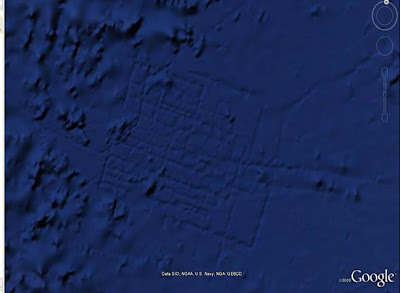 UPDATE - now featured on the Official Google blog here and on the Official Google Earth Lat Long blog here - with Google using these posts to confirm that it is not Atlantis. This is not atlantis. These structures are simply high-resolution sonar readings from a ship that was moving methodically over this region of the ocean. These readings are overlaid on the low-resolution background, creating the illusion of structure. This sort of thing is visible ALL OVER the ocean maps of google maps. Thank you - post updated accordingly! "Anonymous" is quite correct about "These structures (lines) are simply high-resolution sonar readings from a ship that was moving methodically over this region of the ocean." Alibés, B., M. Canals, B.
Geogaceta. vol. 20, no. 2, pp. This area was studied as part of research into the use of abyssal plains for the disposal of radioactive waste. in the abyssal Atlantic Ocean. Q. J. Huggett, R. G. Rothwell, P.
J. Schultheiss, and P. E. E.
Firth, J.V., et al., 1995. Proc. The Azores are only a portion of Atlantis. The island chain actually make up the north-eastern side of the lost civilization. To my best estimate, the center of the island of Atlantis is latitude 36°28'57.42"N and longitude 29°47'15.50"W. With the city itself located at 36°15'56.89"N 26°54'45.53"W. I estimate the island is 600 miles from north to south and 500 mles from east to west. Sonar anomalies? Then how do you explain the line to another square area to the north east? I'm not buying the sonar thing at all.